Enjoying the beautiful Dalmatian Coastline, we were aware that this is only a tiny part of former Yugoslavia and not truly representative of what the Balkan people would want you to see of their countries – a little like visitors ‘doing England’ by visiting London. 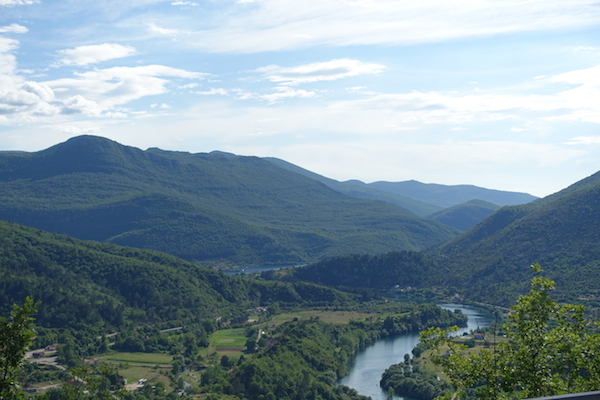 So we set off to explore inland, to get a taste of the real Croatia, Bosnia and Montenegro. When you read about the impact of recent conflicts on this beautiful part of the world, its shocking, harrowing and thought provoking but when you drive through the villages and towns, communities seem to have rebuilt, moved on and are simply getting on with it. However as we became more tuned in to what we were looking at, we found that this is only the day to day industry of living and below, proud nations continue to struggle and the frustrations are still evident. The drive to Mostar from the Croatian coast is stunning, from flat fertile plains by the sea, following the river valley into the hills, alongside lush green hills seemingly untouched other than by the wild boar that you are frequently warned may be crossing the road. At the border there must have been one hundred cars, with a myriad of unfamiliar plates in front of us, so in the hour or so that we waited, there was plenty of time to relook at the map and question whether this detour would be worth it. This was the only route in to Bosnia from this direction though so even if we missed Mostar this was our only option to be able to visit Bosnia. Eventually we got to the checkpoint booth and the burley border guard confirmed we needed an insurance document so after a visit to another building and a short exchange in pigeon English, we were on our way. The queue coming the other way was just as long. As Mostar peaked out of the green hills in the distance the roadside gradually became lined with concrete buildings, some evidently unused, others newly built ventures and many still showing the shrapnel signs of conflict. A half made two lane road led us to the centre where in one block you find a plush hotel, the next a tumble down stone building and the next tall apartment blocks thrown together and not quite finished or crumbling. At every traffic light young boys tried to wash our windscreens and knocked on our windows hopefully holding their hands out. As we parked in the shadow of one of the half built / half crumbling blocks of flats, amidst many new looking Bosnian cars, a lady pushing a pushchair pointed out a free parking place. As we got out of the car and thanked us, she held out her hand for her fee. 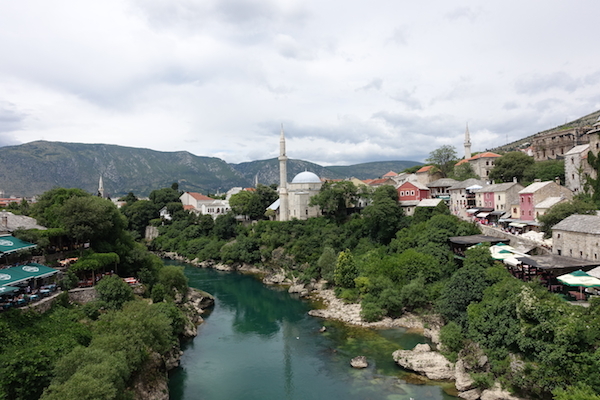 The area around Stari Most, the 16th century Ottoman bridge destroyed in 1993 and rebuilt in 2004 with the help of UNESCO, is the main attraction. Its surrounds are beautiful, it cannot be denied, stunning architecture looking down on the traditional terraced houses clustered on either side of a fairy tale river and beyond to the green rolling hills. A stone lying loose at the beginning of the bridge reads ‘Don’t forget 1993’. It felt like this is a memorial to 1993, yet at the same time with an over-finished, Disneyland feel. Coach loads of people packed the tiny cobbled streets, meandering past hawking restaurants and back to back shops in the traditional cottages, selling masses of souvenir merchandise which, in some shops, included bullets, knives and shells presumably from the Balkan regions many conflicts. I can’t help thinking that most people visiting would miss the significance of 1993. It is actually only evident when you stray away from these few perfectly ‘preserved’ streets and see the battle scarred buildings which many do not see on the route back to the coach park. 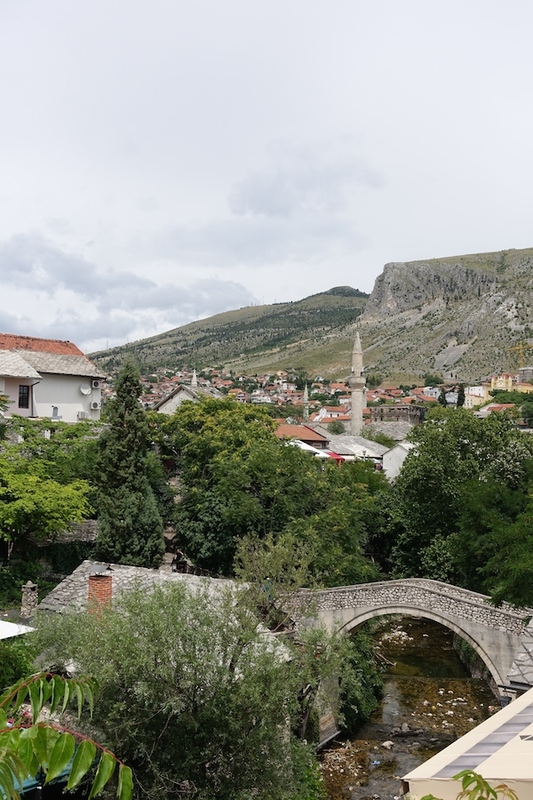 I can only hope that some of the camera carrying visitors are spending their money there, not just viewing and leaving, and that this money is finding it’s way past the UNESCO designated heritage site to the real Mostar and its inhabitants. We didn’t like what we saw but we fully appreciated that there is a need to move on and rebuild. 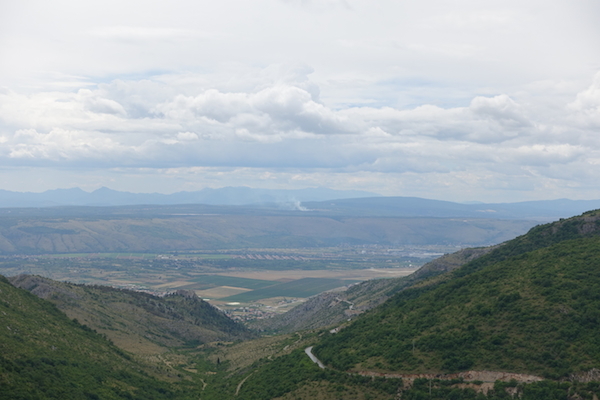 We left and climbed over the hill towards Montenegro and then Bosnia revealed its expansive and spectacular landscape.